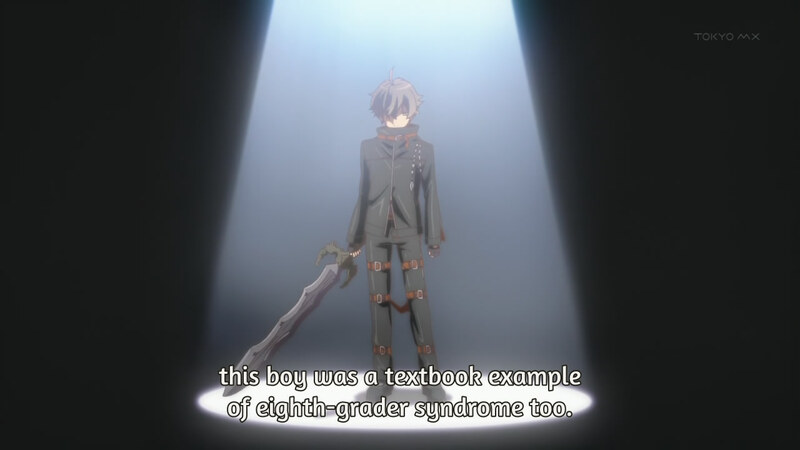 "Chuunibyou" or "eighth-grade syndrome" is a condition where people believe they have super powers. The first time I heard this term is in the anime Chuunibyou Demo Koi ga Shitai! Is this syndrome real? Is there any medical term or at least more common term for this? Chuunibyou describes teenagers around the age of fourteen that try to look cool to impress people around their age and are self-important trying to be unique. This way of thinking, however, may continue even after the teen reaches adulthood, but it does not actually relate to any medical condition or mental disorder. It's more like a growth phase for some teenagers. Based on "Chuunibyou User Manual" (中二病取扱説明書, Chuunibyou Toriatsukai Setsumei Sho) by Saegami HYOUYA, there are 3 types of chuunibyou. DQN-type pretends to be antisocial even though they aren't, or can't be and has made-up stories about antisocial behavior (gang fights/crime). "Come on, I know you're too kind to be a gangster." "Don't take that bandana off my left wrist. It's sealing an evil spirit inside me and if you take it off I may go berserk." 3 The Free Dictionary Language Forums: "Japanese Slang--Chuunibyou"
As for medical term or more common term for chuunibyou, they actually show it on first episode. eight grader syndrome, pubescent crisis, fourteen sick, hebephrenic schizophrenia, 8th grader syndrome. A decade ago it was still considered to be part of the rebellious age of puberty. Disorganized schizophrenia, also known as hebephrenia or hebephrenic schizophrenia, is thought to be an extreme expression of the disorganization syndrome that has been hypothesized to be one aspect of a three-factor model of symptoms in schizophrenia, the other factors being reality distortion (involving delusions and hallucinations) and psychomotor poverty (lack of speech, lack of spontaneous movement and various aspects of blunting of emotion). In reality, Chuunibyou is way more common than we usually think. That’s because it isn’t just about pretending to have superpowers, but rather about pretending in general. And its categorized into 3 types by how people tend to pretend. Not the answer you're looking for? Browse other questions tagged terminology chuunibyou-demo-koi-ga-shitai or ask your own question.